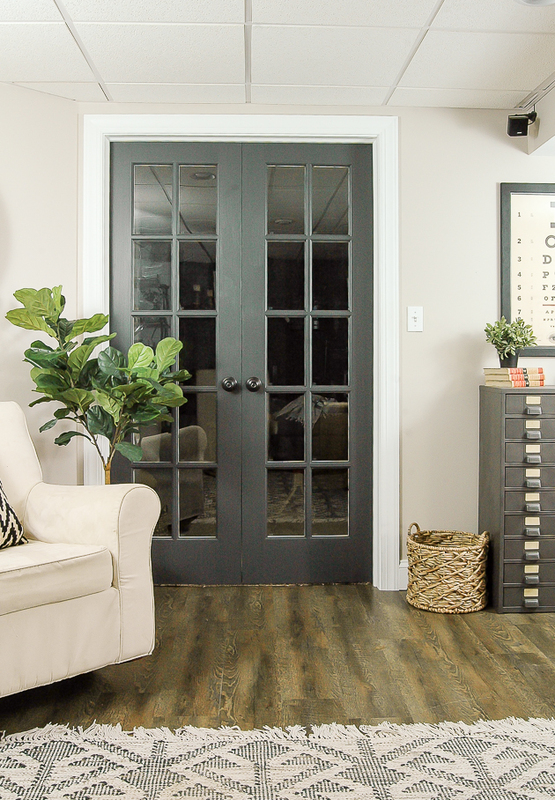 Painting your interior doors dark can instantly add contrast and style for an easy and affordable update! 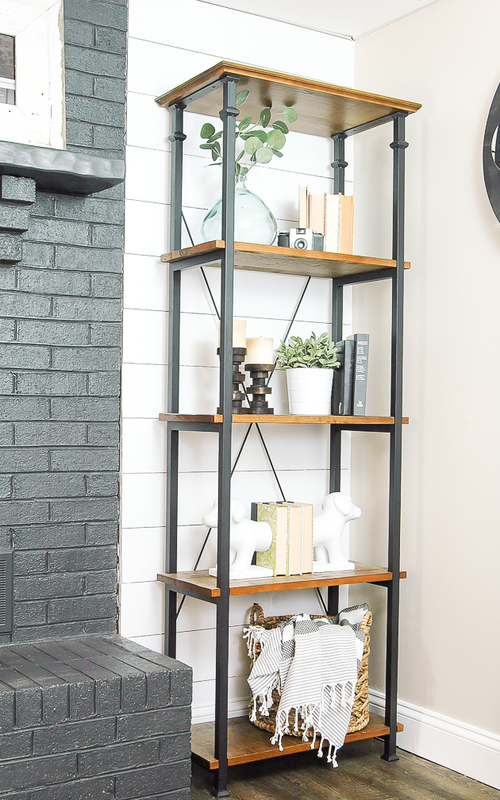 When it comes to home decor there's one design element I can't get enough of. 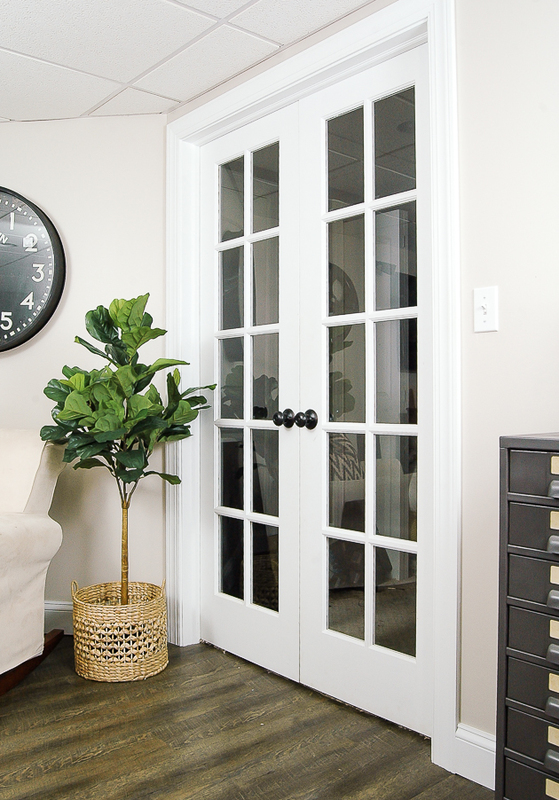 From crisp white plank walls against painted dark wood furniture to dark gray doors paired with bright white trim. Contrast is one design element I love and crave in my home. The best part is, contrast can be achieved with little effort and expense. 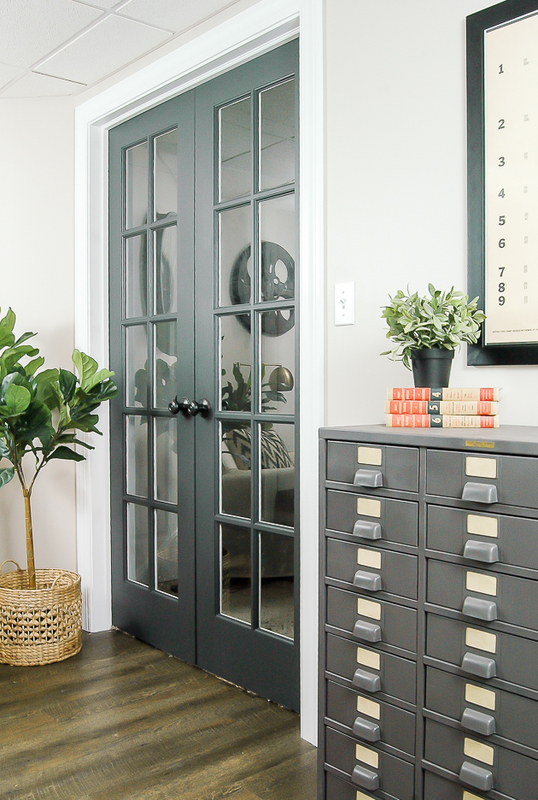 Over the past few years, I've been craving contrast in my home and have been slowly painting our interior doors my favorite charcoal gray (Sherwin-Williams Iron Ore). Almost all our upstairs entry doors have been painted and just this past weekend I finished painting the french doors in our basement. This little corner of our basement has come a long way since I accidentally flooded it a few years ago. Actually, our entire basement has come a long way. It used to be the dumping ground for toys and random, hand-me-down furniture. Over the past year, I've been slowly renovating our basement and turning it into a space that better fits my style and needs of our family. I've installed new floors, painted the walls, removed the carpet from the stairs and refinished the treads, bought new furniture, turned a large IKEA bookcase into lockers, installed tile backsplash on our bar, painted the fireplace, installed a plank wall and remodeled the bathroom. I only have a few projects left and last weekend I finally crossed another one off the list. The french doors that lead to my husband's office (AKA junk room) were finally painted to match the rest of the basement doors. 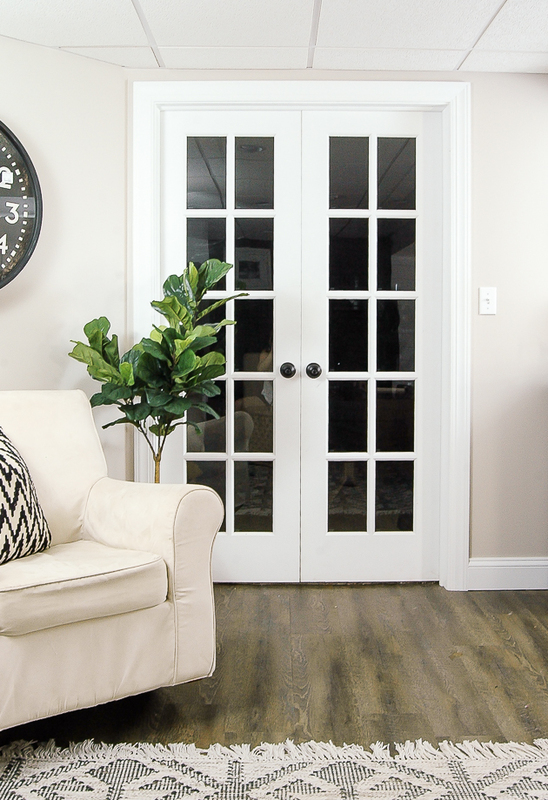 I liked the clean look of the crisp white doors, but nothing beats the look of dark doors against white trim. The doors now tie in with the painted fireplace that's just across the room. It might not make sense now, but the space is so much more balanced with the doors painted. 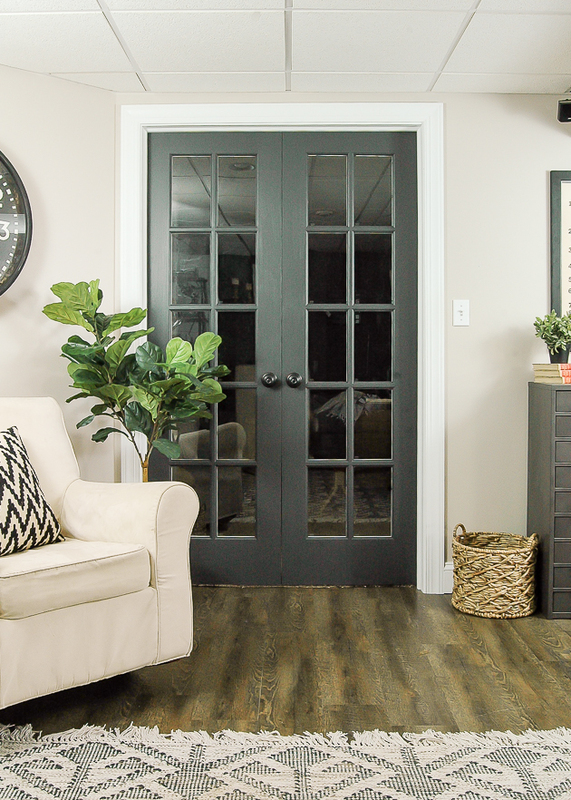 Do you love the look of dark doors? Are you too afraid to take the plunge? 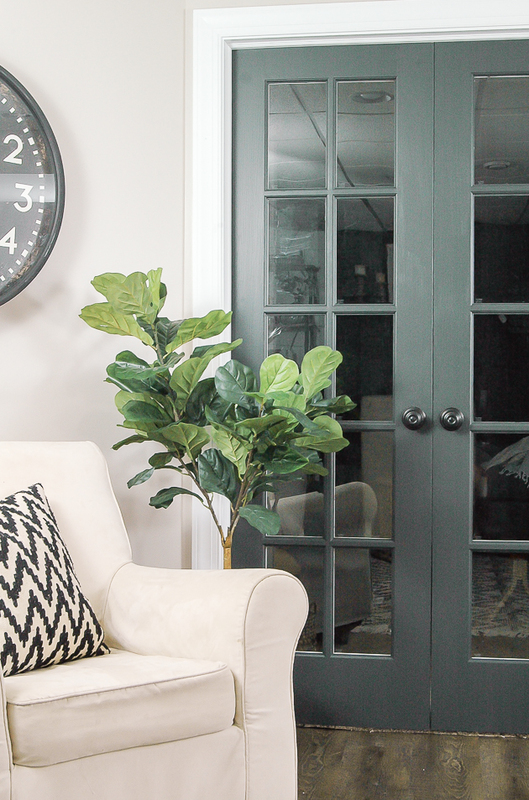 I promise, painting your doors dark will make all the difference and will totally transform your space. It's a quick and easy update that makes a huge impact with little money, time and effort. The best part is, it's only paint. If you really don't like the way they look you can always paint them back. My vote would be for the white, not that the iron ore colour isn't nice, I prefer white. I LOVE this color and the contrast is so pretty! 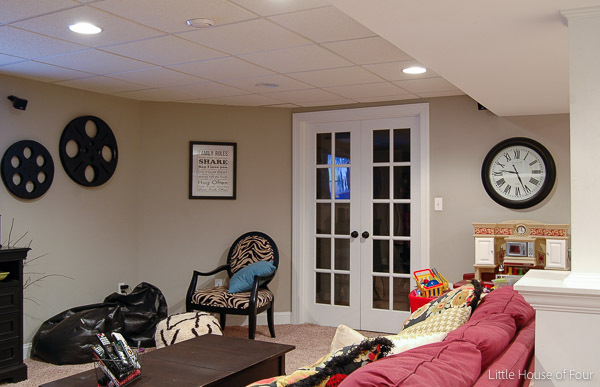 What paint color is the walls and trim of this beautiful basement? May I know if you uninstalled the doors from the frames before painting it or..? No, I did not uninstall the doors before painting. I painted the sides, but just went around the hinges. If you are not comfortable painting this way you could always use Frog tape to cover the hinges or remove the door altogether. What finish is the paint? What color is your window trim painted? We're using a dark gray for our doors and white for walls, both sheet rock & ship lap. Also using white for baseboard trim. Thank you. My go-to dark is BM's 'Dragon's Breath.' It's a black with other nuances of color in it. Absolutely love it. I choose satin finish, using an extender, with a brush. It's so pretty I sit and stare at it! So I know what you mean by loving contrast!